Choose from a selection of 21 holiday rentals in Guardamar del Segura. Use the search form to the left to filter the results and pick your choice of self catering accommodation in Guardamar del Segura. We have a good selection of holiday apartments in Guardamar del Segura perfect for family, single, romantic and group holidays. You may prefer to take a look at our listed holiday villas in Guardamar del Segura or holiday apartments in Guardamar del Segura. Find your holiday homes by a specific type using the property type drop down in the filter. Filter the holiday homes in Guardamar del Segura by a specific area using the area list above. Elegant and quiet holiday apartment in Guardamar del Segura on the Costa Blanca. This functional holiday apartment, with everything you need to spend a great holiday, is just 160 meters from the long white sand beach where you can enjoy long walks and romantic sunsets. 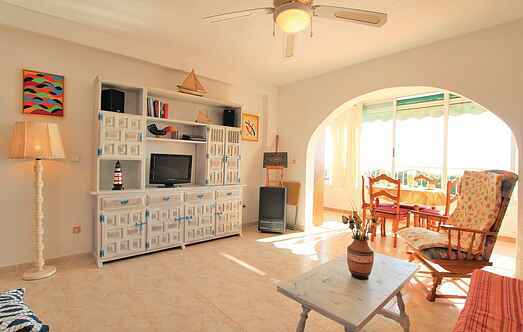 Don't miss your chance to stay in this wonderful and functional holiday apartment. Conveniently situated next to the nature park grounds, the property is ideal for nature lovers. This charming holiday home with cosy interior is perfect for families as well as couples who want a longer stay. This charming apartment boasts a wonderfully secluded roof terrace with panoramic views of the salt lake, the mountains and the lemon groves.